Ye Glutton, this Norman Rockwell painting, appeared on the cover of Life Magazine published November 22, 1923. Alternate titles for this illustration are Pilgrim in Stocks and Thanksgiving. This was the twenty-seventh cover by Rockwell to appear on Life Magazine. 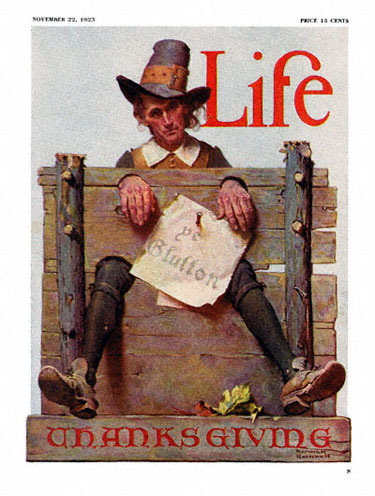 A Rockwell painting only appeared twice on Life magazine's cover in 1923 and twenty-eight times in all. The original oil on canvas painting, 31 x 22 inches or 79 x 59 cm, is part of the extensive collection of the Norman Rockwell Museum of Stockbridge Massachusetts. This painting also appears in four Rockwell commentary books. It appears as illustration 178 of ***America.shtmll***, as illustration 211 of Norman Rockwell: Artist and Illustrator by Thomas Buechner, on page 39 of Norman Rockwell: A Sixty Year Retrospective by Thomas Buechner and on page 46 of Norman Rockwell, A Definitive Catalogue by Laurie Norton Moffatt. For 1923, Rockwell painted a different kind of Thanksgiving painting. In this painting, we see a Pilgrim in stocks. The stocks do not look like the joke stocks we see in amusement parks. There is no rough wood on those stocks. These stocks, no doubt commissioned by Rockwell to be authentic, are made from rough poles and scrap boards. Splinters may also be a part of the punishment. To the front side of the stocks is tacked a sign that bears the designation of his offense, Ye Glutton. How much would he have eaten to be charged with gluttony? He doesn't look overweight. I doubt many pilgrims were. They barely had enough food to survive during their first years in the New World. Under those conditions, any form of overeating would have been discouraged, both publicly and privately. This was Rockwell's subtle way of reminding Life readers not to over-indulge at Thanksgiving. It's just a good thing that gluttony and overeating is no longer punishable by imprisonment in stocks! Or maybe not.